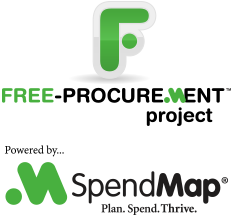 QuickBooks is the most popular Accounting system in use by the Free-Procurement community, so we thought we’d give you a little bonus gift with the 2014 release of SpendMap. We’ve built direct integration with QuickBooks to push approved invoices (bills) and expense reimbursement transactions directly into your QuickBooks database, without the need for batch file exports and imports. So, for example, once you have approved a supplier’s invoice for payment, SpendMap will create a pending Bill in QuickBooks, so you can cut a check to the supplier and post the transaction to your G/L, with no duplicate data entry. Direct QuickBooks integration is coming soon, along with 20 or so other new features and capabilities, in the 2014 release of the free version of SpendMap.